TONIGHT Color Collective Comedy make their debut on the Upright Citizens Brigade mainstage! Watch two brand new sketch shows be birthed before your gooey eye balls this very evening! Joined by “Gossiping About My Damn Family,” The Color Collective have curated their greatest hits and fan favorites to be performed on the UCBTLA stage for the first time. 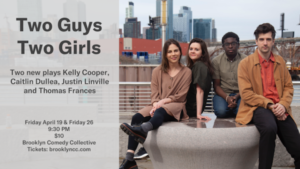 For the uninitiated, this variety show “features diversity and representation in sketch comedy, dance, stand-up, and live music.” Come support them in this most entertaining endeavor! Mentions: Show 7pm. Buy general admin tickets HERE. FREE for UCB sketch and improv students. UCB Sunset is located at 5419 W Sunset Blvd, Los Angeles, CA 90027.